Nachos are a crowd favorite but, sadly, your doctor will give you major side eye if you eat too many of them. This recipe is a healthier take on nachos yet it will still satisfy your cravings for something crispy, cheesy, and snackable. The base of the nachos is sweet potato chips, which have more nutrition than tortilla chips. Instead of using bottle sauce, which comes loaded with sugar and preservatives, you cook up a homemade barbecue sauce. It comes together right in the pan with your chicken. Pile that chicken onto your chips, add the cheese, and let the gooey, melty magic happen. If you want to make a vegetarian version of these nachos, use black beans instead of chicken. Feel free to pile on any other toppings. Some of our favorites include pickled jalapeños, sour cream, sliced scallions, chopped tomatoes, and shredded lettuce. Per Serving: 522 calories; 28g fat; 22.1g carbohydrates; 44g protein; 122mg cholesterol; 422mg sodium. Really good! Sweet potato chips will now be a staple for me when I make nachos. I still love regular tortilla chips, but this gives off a nice sweetness that I didn't think would work here. i used tortilla chips because they were all i had. so freaking delicious. will definitely make this bbq chicken again. i used maple syrup instead of sugar to make it paleo. 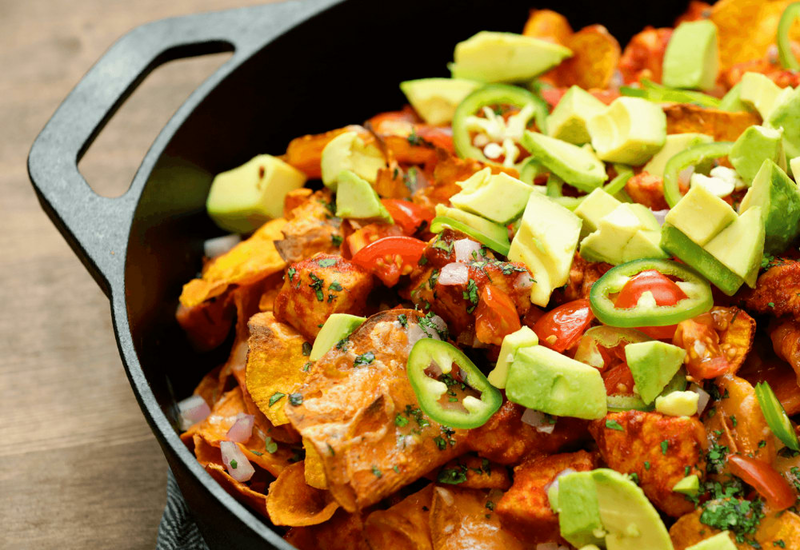 This is a healthier take on Nachos that uses sweet potato chips instead of nacho chips. It packs a real punch and is a flavor bomb. A bite containing chicken will explode in your mouth with flavory goodness. I can't recommend this recipe more. Just make it. Eat it. Then make it again. It tastes so good. This recipe is incredible. Nachos are a big deal in my house, and this dish is definitely A-rated, 5 star, dad approved. Never would have thought to use sweet potato chips! It was amazing. I was a bit skeptical at first, but these were really delicious. Next time I will probably make my own sweet potato chips with my spiralizer.